A hardened ex-con returns to his working-class Rome suburb with the dream of improving his family’s life in this immensely watchable redemption drama. 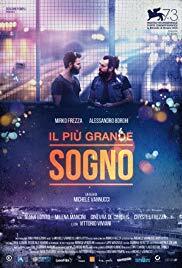 Based on the life of its protagonist, Vannucci’s loosely-scripted film follows 40-yearold “Mighty Mirko” (newcomer Mirko Frezza). Back home, his neighbourhood is still as troubled as it was when he left years ago. So when Mirko unexpectedly finds himself head of the homeowners' committee, he throws himself into the task of rebuilding the community he believes he helped destroy, working with the mixed bag of locals on hand to clean up the town. But walking the straight and narrow isn’t easy when your father is a criminal (“A leopard never changes its spots” he reminds Mirko) and temptation lies around every corner.